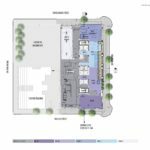 The project will be located on a three quarters of a block site currently owned by Goodman family controlled Downtown Development Group, and bound by SW Broadway, Clay, Park and Columbia. A residential building at the corner of SW Clay and Park is not part of the site. 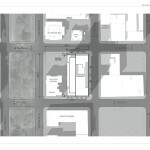 The site was mostly used for surface parking, with the exception of the one eighth block Oregonians Credit Union building at the corner of SW Broadway and Clay. 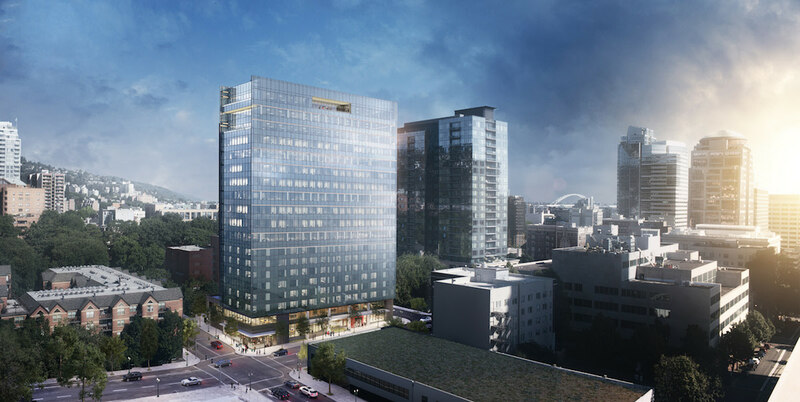 The Oregonian Credit Union building was demolished in June 2016 The quarter block facing the Park Blocks has residential zoning, and therefore cannot be used for the hotel / office development. 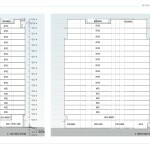 The building has a Floor Area Ratio (FAR) of 15.43:1, which 3.43:1 above the 12:1 limit allowed by right on the site. 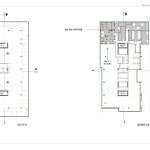 In order to gain the additional 68,000 sq ft of floor area the applicants are using the Central City Masterplan provision of the Zoning Code, which allows FAR to be transferred between sites. 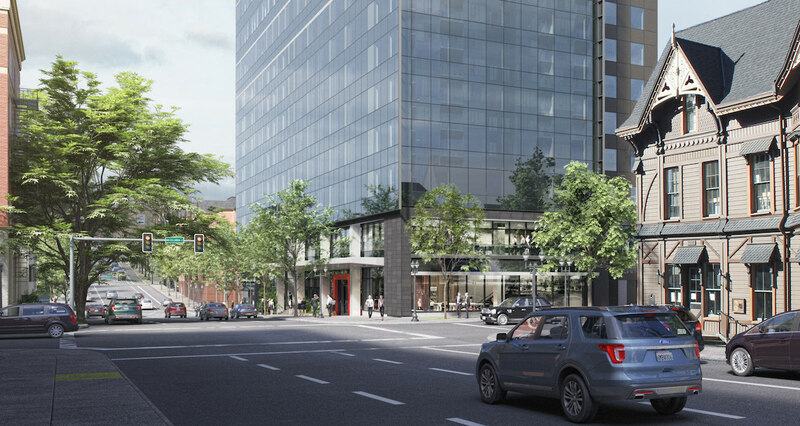 The additional FAR will come from the Custom House Building on the South Park Blocks, which is a designated historic landmarks with excess FAR. 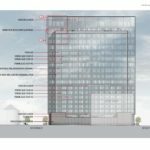 In order to show a public benefit for allowing the FAR transfer, the developers have agreed to a number of commitments beyond what is required by the zoning code. 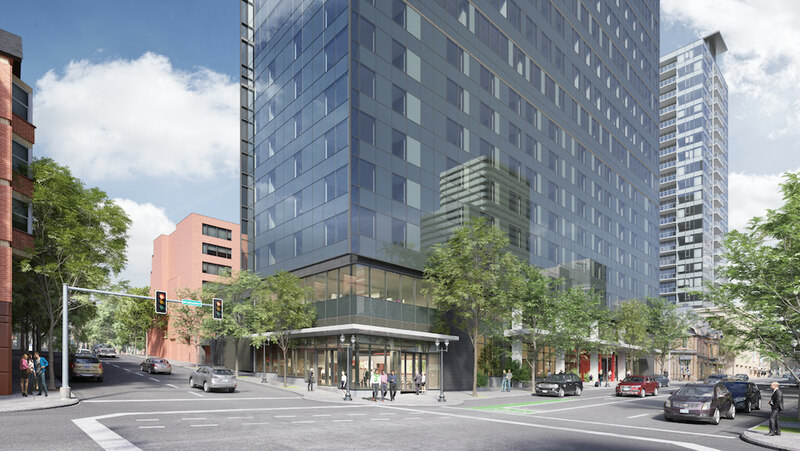 On the quarter block parcel with the residential zoning the developer will build a new residential building of at least 60 units, with 33% of the units being reserved for people earning up to 80% of Portland’s Median Family Income, for at least 40 years. 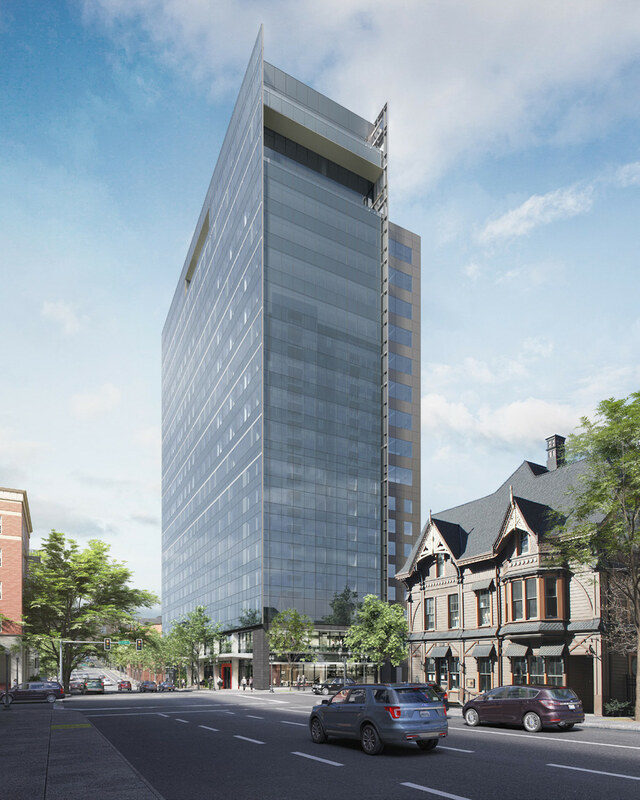 Permits for the project need to be obtained before the Certificate of Occupancy is obtained for the Broadway Tower, and the residential building needs to be substantially completed by June 30th 2020. The developer will also donate $375,000 to the Parks Foundation by June 1st 2017, to be used exclusively for the development of a South Park Blocks master plan. This will identify improvements to the existing Parks Blocks, including vegetation management, ADA improvements, and lighting. 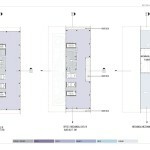 Finally, the developer will construct improvements identified in the plan on Park Block 11 (directly adjacent to the site), simultaneously or immediately following construction of the residential development. 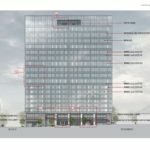 The primary material for the tower will be a glass curtainwall system, with a shifted moving pattern of vision glass and two colors of spandrel glass. 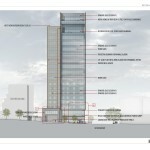 Terracotta rainscreen cladding will be used at the base of the tower. 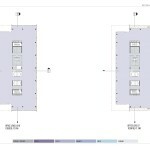 Metal panel, integrated into the curtainwall system, will be used on the north and south elevations. I think the building is very attractive, and you guys have been great to work with through this process. I know this was pretty difficult, so thank you very much for coming back a couple of times and being very agreeable to what we’ve asked for. I think the massing of the building is really elegant. I like the slab tower. Fabulous. The continuity of the design from where it meets the sky, all the way down to the ground is just really nice. 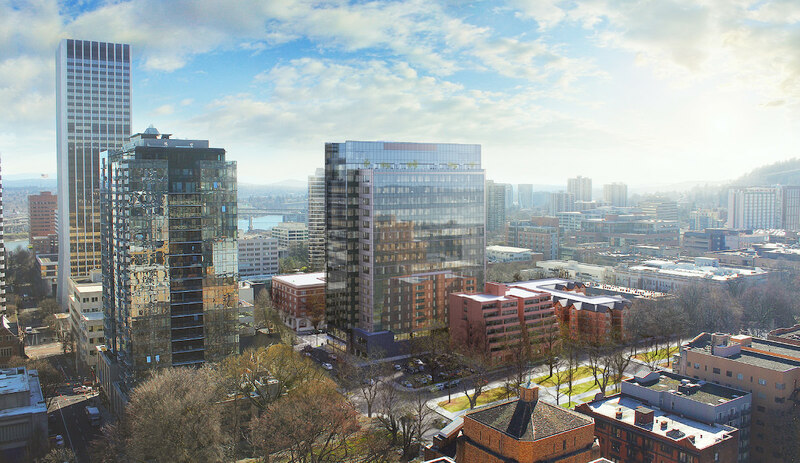 I think It will be a super addition to Downtown Portland, and the changes you were willing to make between the last hearing and this one are very well received. So thank you very much. 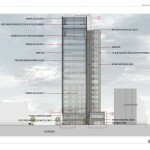 An Excavation and Shoring permit was issued for the Broadway Tower on June 30th. Construction began shortly afterwards. 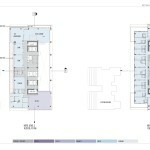 This entry was posted in BPM Real Estate, Broadway Tower, Downtown, Downtown Development Group, GBD Architects. Bookmark the permalink. At least the glass box has a handle at the top. Yawn. Just another glass box. Stunning! Love seeing the new highrises here! Let’s build up the skyline! Oh, yes! Let’s needlessly block out the views and sun with charmless, antiseptic and ugly structures while we lose our historic and civic treasures! Hooray!! 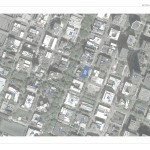 It’s the blight developers boom rush in Portland!!! The former parking lot was quite the civic treasure. I used to live at the Ladd – the high-rise apartment right next to where this glass box is coming up. The south facing units used to have a stunning view of the OHSU hill. Now the view will be just a wall of glass!